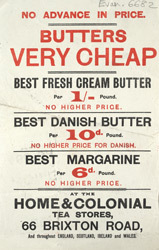 Despite its name, this shop was actually a general grocery, selling items such as butter and margarine as well as tea. In the Victorian era, tea was a popular drink for all levels of society, sold loose in leaves by the pound. Shop counters had rows of compartments filled with the different varieties of tea. Proprietors would weigh the tea and pack it into paper bags. This provided the opportunity for unscrupulous shopkeepers to stretch out their supplies by adding sawdust and other materials to the containers. This practice was a spur to the development of the teabag in 1904.